Social development is linked to many other parts of your child’s overall growth, which is why it’s important to start socialization with other children at a relatively young age. Social interaction helps young children to develop a sense of self, and also start to gauge what others expect from them. Sending your child to a kid’s engagement facility or indoor play center can give them the social interaction that they need with children of their age, and help them reach other developmental milestones. By playing with other children, they learn skills that stick with them their whole life. Young children are egocentric by nature. Bringing them to a kid’s entertainment facility where they meet kids their age helps your child naturally come out of that phase. Sharing, creating boundaries, and analytical thinking all come from socializing and interacting. Children learn to have empathy for other people; recognize when their friends are sad, upset or happy. Kids then, eventually start to use these skills at home with their parents, siblings, or even pets. Putting children in a social environment will also help them to learn discipline and consequences for their behaviour. As they develop and pick-up social cues they learn what behaviours or reactions are appropriate and which ones aren’t. Going to an indoor play facility surrounded by other kids gives children the consistency that need for their social development. As your little ones grow, so will their maturity. So many decisions go into choosing the right play center and the right timing. 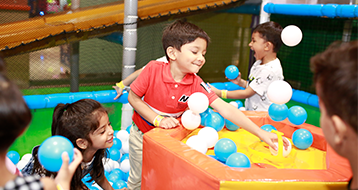 Playbox offers a safe, hygienic and surveillance environment for your little ones to socialise, make new friends and develop their social skills and cognitive thinking in an ambience of FUN! Laying the foundations for socialization and problem solving is absolutely crucial at a young age. Socialization for children is benefits their overall development and we can help you support that!